Let’s face it: customers having spray foam insulation installed want to be well informed about the kind (or kinds) of SPF you plan to use in their home. There are several considerations when working with customers before an installation. First, it’s important to review with each customer the entire project, from start to finish, including safety measures you will take on the job. That you will be clearing the area of kids, pets and other individuals not wearing protective gear until the structure can be safely reoccupied. Take appropriate precautions to avoid high heat or flame near the application site, including having all of your team members avoid smoking on the job site. Finally, remember, you are ultimately responsible for cleaning the work site thoroughly so unprotected workers or occupants can safely return to the building. For more information about customer service-related SPF topics, as well as why you should consider teaming up with a spray foam equipment provider, check out our new e-book. 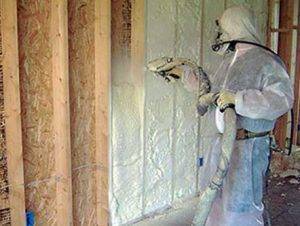 Or, to find spray foam insulation equipment, such as spray foam rigs, contact us today.